All steel 350 lb. capacity. Skid resistant black mat. Chrome plated 18 gauge steel for durability. 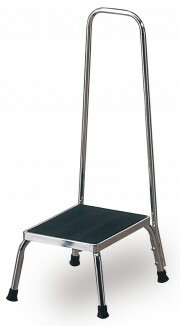 Dimensions: 8.75" H x 11.25"W x 14.25"L. Handrail is .88" chrome plated tubular steel. Height is 35.75" from top of rail to floor. Easy assembly. Only 30 Available In Stock.